We launched our association with Link Ethiopia in 2003. Until recently Link Ethiopia has been run by the boys and staff at Doctor Challoners Grammar School in Amersham. 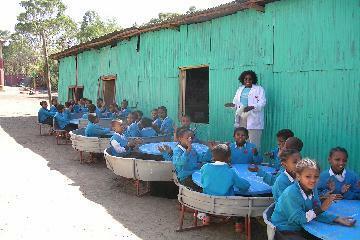 It began in 1995 when the school decided they wanted to link with a school in Ethiopia. They chose the Fasilides School, the main state comprehensive in Gondar, which is the third largest town in Ethiopia and one of the ancient capitals. The boys write letters several times a year to the school and also support them through fund-raising, helping them to buy much needed equipment, etc., as well as taking groups of pupils to the region to work with the community. Other schools have now joined the link. The latest recruit is Queensmead. Our part is two-fold. Firstly, we have been linked with a wonderful kindergarten called Rekebnaha. Rekebnaha is near to Fasilides and is run by an amazing lady who sold her house to set up the school. The second part of our link is to sponsor two children through an organisation called The Kindu Trust - Hiwot, born 8th April 1999 and Samuel, born 29th September 1998. The money we send to the families pays for their home, food, clothes, shoes, any medicine they may need and for their school. We raise money for the charity at the Harvest Assembly each year. The money raised has gone to the school to pay for the completion of a project to build a library and has made a valuable contribution towards the cost of educating some of the many orphans in Rekebnaha. We have also sent letters and drawings to Rekebnaha and in return they have sent us some wonderful gifts. These are exciting times for our link and it is a privilege to be involved. Please visit the Link Ethiopia website at www.linkethiopia.org to find out more. Our international charity, Hope, works to help vulnerable children in Zimbabwe through emotional and social support, education, economic enpowerment and child rights!